Mr. Branica's 30 year career in technology began in 1984. Breaking into the newly deregulated telecommunications marketplace was a challenge that simply could not be resisted. After spending a significant amount of time researching how the massive telecommunications monopoly was being deregulated and broken up, he joined a team of entrepreneurs in Sarasota Florida and began developing privately owned public telephones, 0+ Billing Services and Operator Services. Elcotel was a pioneer in digitized voice applications. Elcotel has the distinction as the first company to successfully bill 0+ traffic with the RBOCs. Elcotel went public. In 1992, Mr. Branica founded Key Voice Technologies. Key Voice was a voice mail developer engaged in the burgeoning voice mail industry. With a great team in place, Key Voice grew rapidly to become a leader in the industry. The company was sold to Comdial Corporation in 1996. Under Mr. Branica’s leadership, Key Voice continued as a subsidiary of Comdial, growing sales every year and developing a great network of resellers both Comdial dealers and independent resellers. Key voice prided itself on innovative software that included voice messaging, automated attendant, integrating with hundreds of disparate phone systems, FAX, ACD, IVR and was a leader in Unified Messaging. In 2001, Mr. Branica joined Comdial’s corporate management team as its CEO. Comdial, a vertically integrated manufacturer and designer of world class business telecommunications systems, occupied a sprawling manufacturing facility in Virginia. Comdial products were sold through distribution with a large dealer network extending throughout North America. With Comdial in need of a solution to staggering debt and high product costs, Mr. Branica was responsible for outsourcing manufacturing, reducing the debt and modernizing the product lines all before leaving in 2004. Having firsthand experience in hardware manufacturing and realizing that the old technology of phone systems had not changed very much in 100 years, it became very obvious that new technology was superior to the aging design of business telecommunications systems. There were new business models developing in the VoIP world that eliminate the hardware components of a PBX, replacing the hardware with software. This compelling reality gave rise to the development of IPitomy. After all, a software based PBX system will never wear out, and will always be relevant. 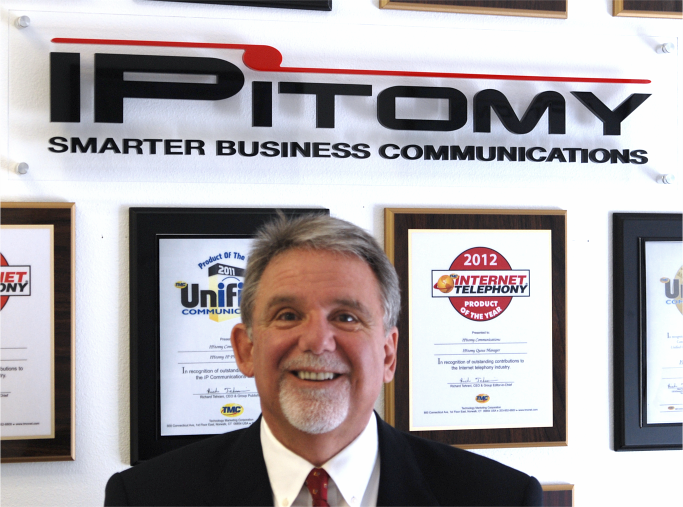 IPitomy was born in 2005 and a team assembled to bring the new IP PBX system to market. IPitomy has succeeded in developing award winning IP PBX systems and is now moving into the virtual space, providing cloud based systems, virtual IP PBX Systems, premised based systems, SIP Trunking Services and IP telephones. With over 50,000 extensions currently in service, IPitomy has emerged as one of the most successful IP PBX startups in North America; winning numerous awards. Nick resides in Sarasota Florida with his wife of 30 years Tonie, they have 2 daughters. When not busy working, Nick can be found enjoying the beautiful coast of Florida and all it has to offer or turning a bowl in his wood shop. Drew is the architect and software designer of IPitomy's products. With his team of programmers, magic is created. Drew has a background in developing mission critical software applications in commercial and military environments. Drew has been with IPitomy as it's heart and soul of development since the beginning. Drew's experience in commercial applications as well as sensitive military applications has provided him a great background in designing and developing VoIP applications that require an element of security that has become more important over the past several years. Drew lives in Sarasota with his wife Lora and their 3 children. Family life keeps Drew busy as a dedicated father and husband. The Harrell family enjoys outdoor activities in Florida. When not visiting some of the many Florida attractions with the family, Drew can be found tending to the chickens his family enjoys raising. Drew has an Engineering degree from Washington and Lee University.